Why is Eleanor so irresistible? What is it that stirs our perennial fascination with her? Eleanor lived so long ago – almost nine hundred years – when women, for the most part, had no voice in history. Yet Eleanor’s voice rings out strong and clear. What a remarkable role she played, and what a colourful character she had. Flouting the mores of society in a relentless bid to determine her own destiny, she was vibrant, always supremely confident, sometimes outrageous, and strikingly beautiful. All the necessary attributes to make her the quintessential heroine. Not content to accept the powerless ignominy of her life in Paris as wife to Louis VII of France, she was quite prepared to seize fate and make it dance to her tune. And that is what she did, to fulfil her vision of herself as Duchess of Aquitaine. Eleanor’s sense of self-worth, extraordinary in the twelfth century, with the authority of Church and State united against her, appeals very strongly to women today. Eleanor’s life was never short of excitement and emotion. Breathtaking in her fearlessness, she was not always wise in her choices, yet she still demands our admiration as she pursued her ambitions in a man’s world. She challenged Louis’ control over her, she flirted with forbidden lovers, she insisted on accompanying Louis on Crusade where she survived hardship and malicious destruction of her reputation. Above all she was audacious and daring enough to find a more compatible husband, a brilliant, mercurial, and dynamic man with whom she was destined to rule the greatest Empire in western Europe, stretching from England all the way to the Mediterranean Sea. "A stunning portrayal of narrataor Eleanor of Aquitaine and a gripping mixture of historical fact and O'Brien's imagination make this a must read - but be warned - it's not one to pick up without having a decent amount of time on your hands - my Sunday vanished completely as I wasn't able to tear myself away from it until I read the end! Superb stuff." "...I loved it ... well researched and very well executed ... I am now a committed fan ..."
"Anne O’Brien is fast becoming one of Britain’s most popular and talented writers of medieval novels. Her in-depth knowledge and silky skills with the pen help to bring the past to life and put the focus firmly on some of history’s most fascinating characters. 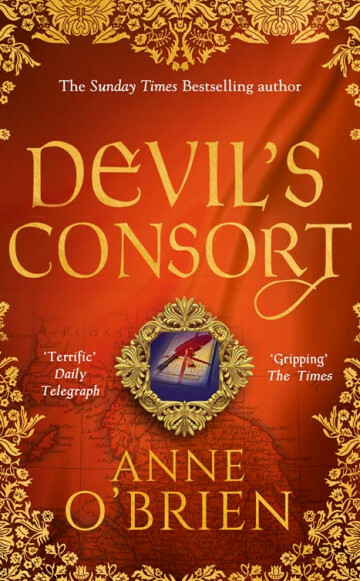 In Devil’s Consort, O’Brien adds yet more colour to the spectacular life of one of the most influential, charismatic and ruthless figures in the rich tapestry of European history. A rich and gripping historical page turner." "...well suited for others who love historical fiction and should stand firmly on the shelf next to other works about her. I’d recommend it!" "Anne O’Brien is definitely an author to watch for historical fiction fans." "O’Brien brings Eleanor, Louis, Henry, Aquitaine and Paris to life with her writing, and it is a gripping story which the reader will find hard to put down, whether or not they already know the story. I loved Anne O’Brien’s 'Virgin Widow'"
"'Queen Defiant' is a fascinating look at the early life of Eleanor of Aquitaine. O'Brien's Eleanor is a fine tribute to the woman that she was historically: complex, ambitious, intelligent, and alluring. Eleanor of Aquitaine would be proud!"